After being inspired by a shop on Etsy, I had to make Juliette a Hankie Dress. I'm not exaggerating when I say this dress took an hour from start to finish. I just started with a dress from Target, removed the bow, added lace hankies and 10" squares of fabrics to the skirt, some pleated fabric at the shoulders and a doily or two hand appliquéd on. I don't know If I've ever had so many compliments on something so easy to make. It does help to have such an adorable baby wearing it (in my humble opinion). Etsy is one of my favorite places to get ideas. Where do you go to get inspired? I admire your restraint, I see something on etsy, think for a moment, "I can make that" then hit the buy button and say Done! I never have to leave my chair and I own it! Hahahaha! 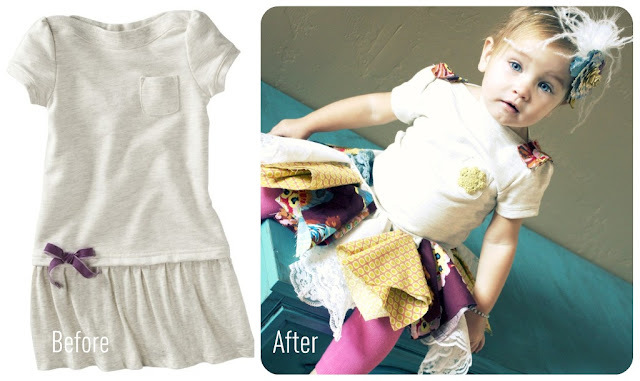 Your little munchkin is so beautiful and the dress is so funky and sweet! I love this outfit! I'm dying it's so cute. :) Where did you get the lace hankies? How did you finish the fabric squares? SOOOOOO cute and yes she is adorable. Making this outfit even more cute! wow. ADORABLE! I love it! I found your blog from French Country Cottage's party. I'm your newest follower. I hope you'll stop by my new blog loveofhomes.blogspot.com & follow along too! Oh, how darling! Would you share it here? Simply Gorgeous!!! Thanks for sharing. I'm always saying, I could make that! my list of to-do's is turning into a mountain! lol. That is beautiful! I can see why you've had so many complements on it! I'm discovering the delights of pinterest for my inspiration just now! People are just so creative!! What a great idea. I love how the little dress turned out. Okay... LOVE THIS! What the heck, when I have a baby pretty darn sure I'll LIVE on your blog. You make the cutest stuff! Oh my...that is adorable!! I love how quick it was for you to make! Thanks for sharing.